It's that time again to visit Bernardo Winery on Mother's Day - May 12th and 13th. Our booth has been relocated to Site #21 in the Merlot Parking Lot (see the map on the website). We look forward to seeing you! I am happy to report that I was able to visit Into the Forest, an international polymer clay art installation, in Pittsburgh, PA. What a lot of work the organizers put in; special thank you to Laura Tabakman, Emily Squires Levine, Julie Eakes and all the volunteers that made it happen. What an amazing collection of forest flora, fauna, and features. Good friends in Pittsburgh joined me for a visit to the gallery, and made the afternoon and evening even more special. Thanks for visiting my website. 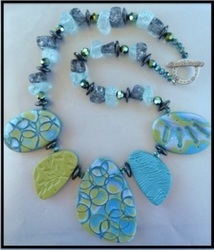 My polymer clay and beaded jewelry and decorative designs are meant for both fun and fancy. 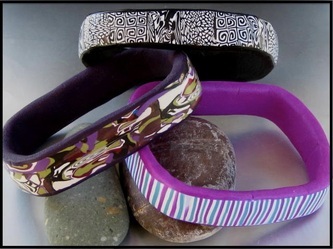 The possibilities of polymer are unlimited and appeal to my 'earthy' approach to the process, colors, and designs of my jewelry. My jewelry and decorative designs in polymer clay often include beads, wire, natural or semi-precious stone, and various surface treatments; creating one-of-a-kind statement pieces, simple pendants, unique decorative items, and many styles in-between. 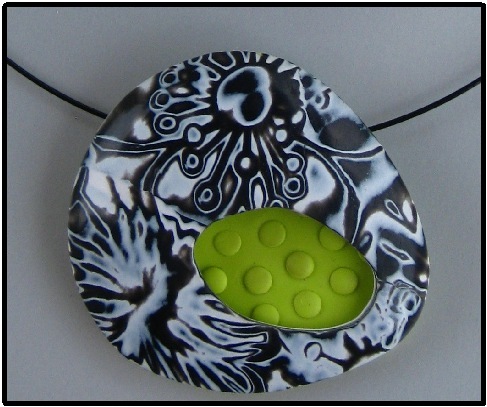 Use the tabs above to tour this website and see my jewelry and decorative designs. The website will be updated on a regular basis so please come back often and watch for new products and/or news. If you would like to learn more about me, please go to About Me. If you would like to purchase an item, ask a question, leave a comment, or receive email notices of new items, upcoming sales, or sale locations, please complete a Contact Me form. See more information below related to New Work, Event Updates, and making Purchases/Returns. 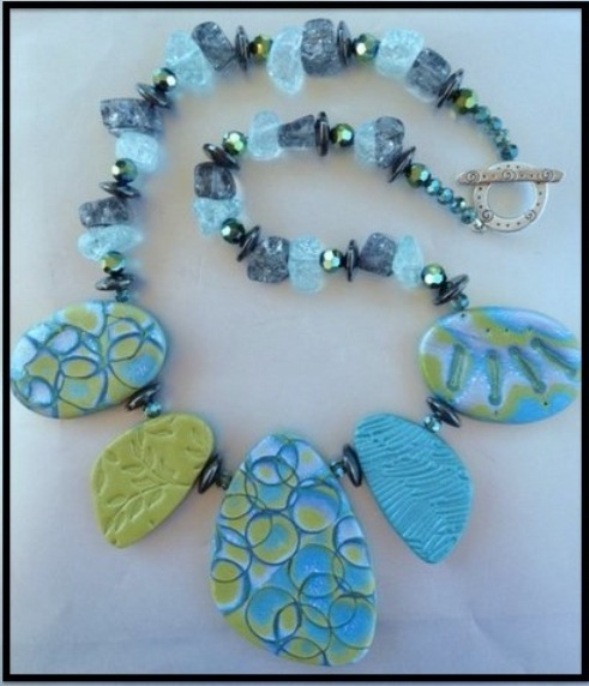 My good friend and "clay-mate" Denise Pinnell and I share a passion for polymer clay art and together, participate in craft fair and other events to display and sell our work, described on our banner as "earthy and girly jewelry designs". 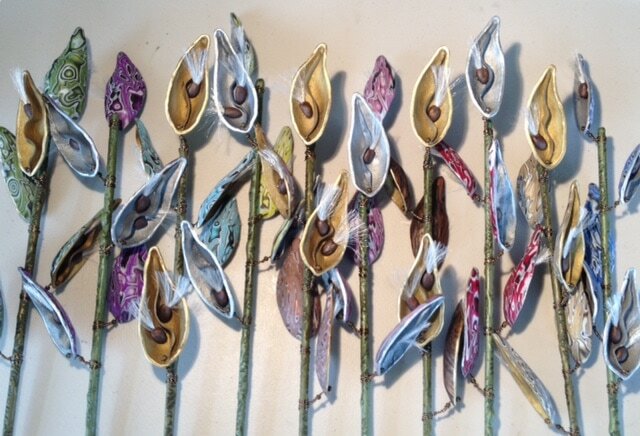 I am "earthy" and she is "girly" so check out Denise's 'girly' works' on her website. I often have new items on every page, so please visit each page. Several items fall into the decor category - such as decorated wine glasses, custom martini glasses, utensils, ornaments and wall art. Want to Host a Trunk Show? : Would you like to host a trunk show? Invite friends over for wine and hors d' oeuvres with a private jewelry show included? If so, send me an e-mail or a message by completing a Contact Me page with your request and Denise and I will get back to you. Please use the Contact Me form to send a message with the Inventory # and description of the item(s) you are interested in. You can include your telephone number so that I can call you or I can respond with a phone number where you can reach me in order to complete your purchase. I can accept most credit cards for payments using PayPal (Visa, American Express, Discover, MasterCard). The purchase cost will include the cost of the item, any shipping charges (I prefer U.S. priority mail), and appropriate sales tax for orders shipped within California. It is important to me that you are happy with your purchase. Returns will be accepted for refund or exchange, if received in new condition within 30 days of purchase. Initial shipping charges are not refundable.